The California Department of Fish and Wildlife (CDFW) invites Sonoma County residents to two upcoming public meetings to discuss the impacts of the drought on endangered coho salmon and other aquatic life. CDFW is urging landowners to commit to voluntary water conservation measures in critical watersheds as a necessary means to save the fish. Thursday, May 14, 6:30-8:30 p.m.
Thursday, May 21, 6:30-8:30 p.m.
CDFW is working closely with several other agencies and organizations, including water interests, to develop strategies to keep enough water in the creeks to support coho salmon throughout the summer. Without major water-saving efforts, the fish will die from low water levels and high temperatures. In addition to promoting water conservation, the department is asking landowners near Dutch Bill, Green Valley, Mark West and Mill creeks to allow CDFW personnel access to their property for continuing fish and creek monitoring. Fish rescue operations may be necessary later in the summer. During the meetings, CDFW representatives will provide an overview of the drought and its impact on these watersheds, the department’s concerns and roles, and basic history and science of the species in these historic waterways. Representatives from local community resource conservation groups will provide information on water conservation strategies and technical assistance to landowners. In April 2015 Governor Jerry Brown issued an Executive Order declaring a state of emergency and called on California residents to reduce water consumption wherever possible. The State Water Resources Control Board adopted an emergency regulation requiring an immediate 25 percent reduction in overall potable urban water use statewide in accordance with the Executive Order. The state drought web page can be found at drought.ca.gov. For complete information and documents to download go to CDFW’s Voluntary Drought Initiative webpage at goo.gl/4rOjd0. The California Department of Fish and Wildlife (CDFW) and National Oceanic and Atmospheric Administration (NOAA) Fisheries announced a Voluntary Drought Initiative today designed to protect populations of salmon and steelhead from the effects of the current unprecedented drought. 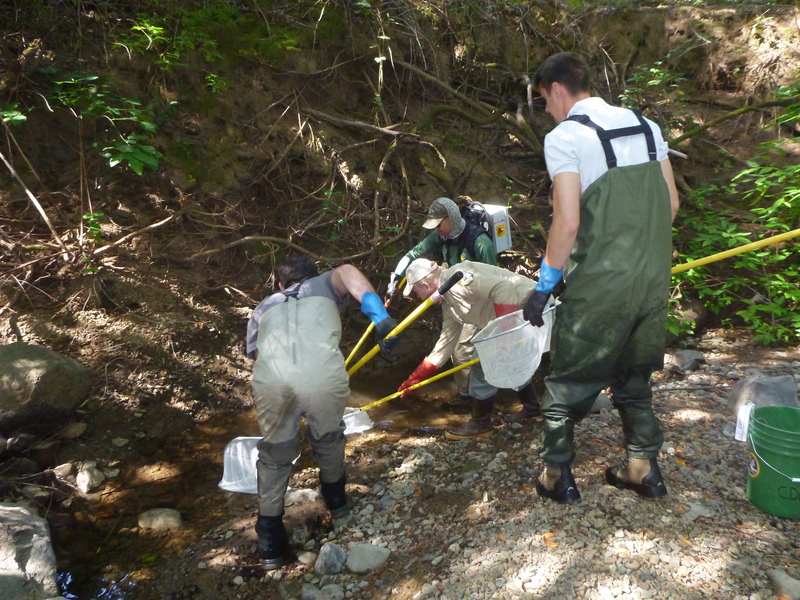 The initiative provides a framework for water users to enter into individual agreements with the two agencies in an effort to maintain enough water for fish spawning in specific high priority streams, and implement other collaborative actions like fish rescue, relocation, monitoring and habitat restoration. The geographic focus includes some Sacramento River tributaries (Antelope, Deer and Mill creeks) and the Russian, Shasta and Scott rivers. In return, landowners and water users will benefit from greater regulatory certainty under the federal and state endangered species laws, and may receive incidental take authorizations for California Endangered Species Act (CESA)-listed fish in case a participant unintentionally takes listed fish species while withdrawing water. This is a temporary, voluntary initiative that is only being implemented during federal and state drought declarations or designations, with the goal of supporting agricultural activities while protecting the survival and recovery of federal Endangered Species Act (ESA) and CESA-listed salmon and steelhead during this crucial time in their life cycle. NOAA Fisheries and CDFW are aware that the State Water Resources Control Board is currently considering curtailing water rights to respond to current drought conditions. This Voluntary Drought Initiative, under the ESA and CESA, is limited to those authorities and responsibilities of NOAA Fisheries and CDFW. However NOAA Fisheries and CDFW are coordinating closely with the State Water Board. While this initiative is separate from the Board’s authorities and independent actions that it may pursue related to the drought, including emergency curtailments, NOAA Fisheries and CDFW intend to support any local cooperative solution formalized through an executed voluntary agreement before the State Water Board as an alternative to mandatory curtailments. A description of the fish agencies’ Voluntary Drought Initiative can be found at www.westcoast.fisheries.noaa.gov/protected_species/salmon_steelhead/voluntary_drought_initiative.html. Today, NOAA Fisheries and CDFW are also announcing the execution of the first set of voluntary agreements with key landowners in the Scott and Shasta river watersheds covering land access for fish rescue and providing critical flows to maintain suitable habitat. For copies of those agreements, please continue to check www.westcoast.fisheries.noaa.gov/protected_species/salmon_steelhead/voluntary_drought_initiative.html which will be updated as agreements are available.